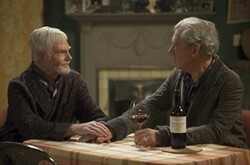 Openly gay actors and long-time friends Sir Ian McKellen and Sir Derek Jacobi found something of themselves when they played Freddie and Stuart in ITV's new sitcom Vicious. This preview by Steve Rogerson gives a few hints of what to expect and looks back at the careers of the two knights. The six-part show starts on Monday 29th April 2013. Two of Britain’s top actors – Sir Ian McKellen and Sir Derek Jacobi – partner in a new ITV sitcom, Vicious, the first of the six episodes due to be broadcast on Monday 29 April 2013. Sir Ian and Sir Derek play, respectively, Freddie and Stuart, two gay men who have shared a London flat for half a century. They first met when Freddie was a young actor and Stuart worked behind a bar. Now their careers are over, they spend most of their time arguing with each other, walking their dogs and reading. The two actors found it easy to slip into the roles of two people who had known each other for that long, because they had. “Some people will be delighted that Derek and I are making fun of ourselves,” said Sir Ian. Both actors are openly gay. Doctor Who fans will like episode two, when the couple go out shopping to buy Freddie a new coat for a Doctor Who fan club event. Doctor Who fandom in the 1970s and 1980s attracted a lot of young gay men. Both actors have appeared in Doctor Who. Sir Derek was Professor Yana in the 2007 episode “Utopia” and The Master in 2003’s “Scream of the Shalka” animated adventure. Sir Ian played the voice of the Great Intelligence in 2012 Christmas special “The Snowmen”. Sir Ian McKellen received Oscar nominations for playing James Whale in Gods and Monsters and Gandalf in The Lord of the Rings: The Fellowship of the Ring, which also earned him one of three Bafta nominations, the other two being for The Lord of the Rings: The Return of the King and the leading role in 1995’s Richard III. He won a Golden Globe for playing Tsar Nicholas II in Rasputin and had nominations for Gods and Monsters and Richard III. He has also had five Primetime Emmy nominations, one for Rasputin and the others for Number Two in The Prisoner, King Lear in Great Performances, himself in Extras and Bill Kraus in And the Band Played On. He is also well known for playing Magneto in the X-Men movies. He was knighted in 1991. Sir Derek Jacobi won a Bafta in 1977 for playing Claudius in I, Claudius and has three Bafta nominations, for Gary Burgess in Philby, Burgess and Maclean, Franklyn Madson in Dead Again and Alan Turing in Breaking the Code. He was nominated for a Golden Globe for Hallmark Hall of Fame, which also won him one of his two Primetime Emmys, the other being for playing Jackson Riley in Frasier. He also has a Primetime Emmy nomination for playing Adolf Hitler in Inside the Third Reich. He was knighted in 1994. Frances de la Tour plays the couple’s best friend Violet, Marcia Warren plays nutty Penelope and miserable Mason is played by Phillip Voss. Iwan Rheon plays their upstairs neighbour Ash. Written by Gary Janetti, Vicious is a Brown Eyed Boy production in association with Kudos Film & TV. It was directed by Ed Bye. The show was co-created by playwright Mark Ravenhill. Co-producers were Gary Reich from Brown Eyed Boy and Gary Janetti. The executive producer was Jemma Rodgers. It was commissioned for ITV by Elaine Bedell, ITV’s director of comedy and entertainment, and Myfanwy Moore, comedy commissioning editor. The official miscellany, celebrating 50 years of Doctor Who. Everything with Sir Ian McKellen worths watching. Should be an interesting show. Good on them and thanks to you for bringing such a light hearted program to our attention. This sounds like a fun show. We watched this last night and were in stitches - really excellent coupling of two outstanding actors and a brilliant supporting cast. Jacobi doesn't seem to have changed since he played Claudius in a series which we really enjoyed so many years ago. I'm looking forward to this, if only for the surreal notion of Derek Jacobi and Ian McKellen in a sitcom!